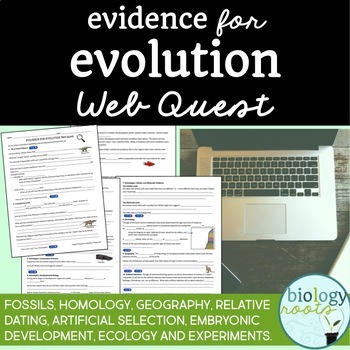 Evidence for Evolution Webquest: a 4 page Web Quest hosted at evolution.berkley.edu. 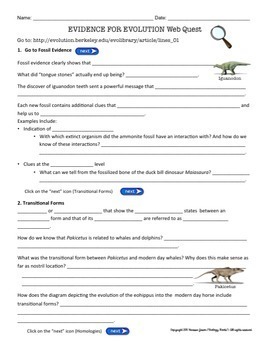 This helps students visualize and learn about different lines of evidence involved with evolution, including fossils and transitional forms, relative and numerical (carbon) dating, geography homologous structures, artificial selection, experiments and a few mentions of embryonic development. 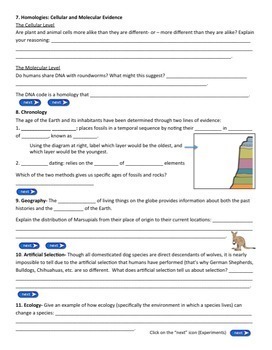 This webquest involves mostly fill ins and short answers where the students need to read the information given and form their answers based upon the clues in the text.